Synopsis: Grades: 1-5 Time: 7 projects; 20-30 minutes each ARTS AND CRAFTS is an amazing book full of creativity and creations. Have a blast with paints, Legos and colors. Learn how to recycle paper, make new ones, print with blocks, recycle old candles, paper pop-up cards, handmade soap and so much more. Build them using easy materials from around the house, recycled items or stores. Fun with Science, Technology, Engineering, Art and Math project ideas. It is a great way to acquire 21st century skills and STEM learning. 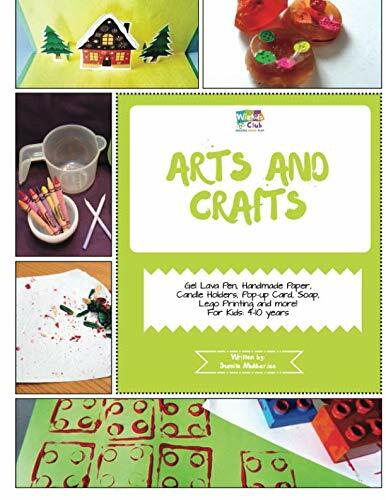 Inside this book you will find projects on: Pop-up Card Crayon Candle Handmade Soap Lego Printing Handmade Paper and many more Make your own crafts today and have fun creating awesome projects! 1. Arts and Crafts: Activity Pack with Arts and Craft Projects: 4-10 Year Old Kids! 3. Arts and Crafts: Activity Pack with Arts and Craft Projects: 4-10 Year Old Kids!